"The CCCTB will make it easier, cheaper and more convenient to do business in the EU. It will also open doors for SMEs looking to grow beyond their domestic market. Today's proposal is good for business and good for the EU's global competitiveness." Well, apart from concerns about the use of that weasel word "competitiveness" (see here for our gripes) we agree with him. And here is a conclusion that is absolutely unequivocal, from a KPMG survey in 2007. Just look at this picture (click to enlarge). That is absolutely unequivocal. A full 78% -- yes, 78% -- were in favour of this measure. (Bear in mind that this is not about harmonisation of tax rates, but about harmonisation of the tax base; Ireland could keep its 12.5% tax rate, for example.) To put this even more starkly, only 16% opposed it. And who were these respondents? The CCCTB has interesting political dynamics which mean its eventual success is only a so-so proposition, as we explained yesterday. Now, once again, we turn to the Progressive Tax Blog (we don't know who runs it, but we like its output very much so far) which masterfully skewers some of the arguments that have been raised against this CCCTB proposal. The first argument by the nay-sayers is that this proposal represents "stealth tax harmonsiation." Nonsense. 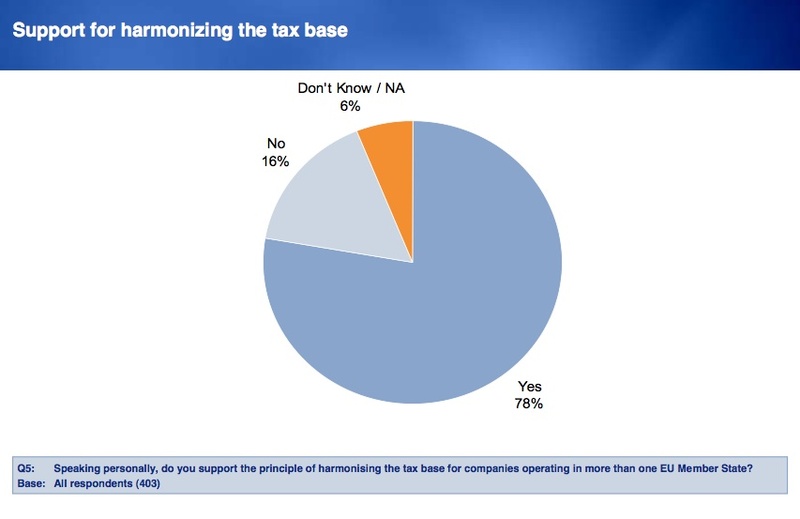 This is not harmonisation of tax rates, but of the tax base, which are two wholly different things. And it's anything but "stealth" - it's abundantly transparent. 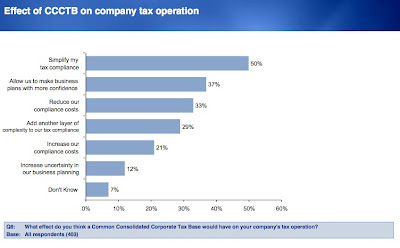 Second, the idea that the CCCTB will restrict the movements of multinationals is ridiculous. 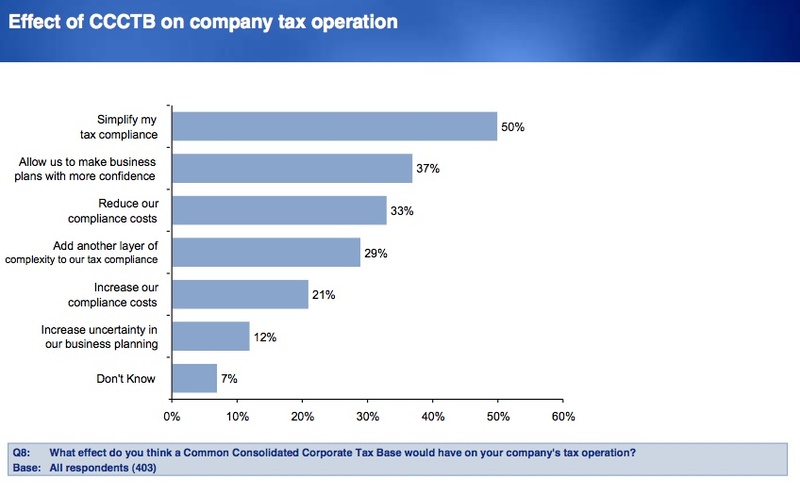 The whole idea for a CCCTB is founded on the basis that having different tax rules in individual member states makes it more difficult and costly for multinationals to exercise their EU freedom of establishment. The CCCTB will make it easy to move to or establish business in another EU member state as common tax rules would apply. "the idea that a CCCTB will mean that genuine inward investment in smaller states will be reduced and instead flock to larger higher profile economies has no basis. What would be reduced is the use of smaller states as locations for tax avoidance planning. . . . there is in fact no tangible impact on the local economy, except for hiring of one or two employees to give ‘substance’ to the arrangements, or directors flying in occasionally for local board meetings." In other words, the CCCTB will reduce tax havenry. And that's what the nay-sayers are trying to protect. Make no mistake - this is a proposal to curb abusive tax haven, or secrecy jurisdiction, activty. And that is why, despite its horrible name, we should strongly support it. Just this once I think you are over-reacting to the use of the word "competitive". I don't think Commissioner Semeta is referring to the infamous race-to-the-bottom tax competition: I see it as saying "The EU is making the ability to be tax-compliant a lot simpler than it would be elsewhere in the world". The businesses that won't come to heel will not have an excuse to hide behind.